It’s a cookbook launch party, and I’m so happy to spread the news about a fellow blogger and friend. I’ve come to know Faith in the last few years as one of the bloggers who participates with me in the monthly Five Star Foodie Makeover, and I’ve come to enjoy and respect her cooking. Faith Gorsky publishes a beautiful blog , an Edible Mosaic which can be found on Barnes & Noble and Amazon under the same name. When she asked me to participate in a her book launch party, I had no hesitation. 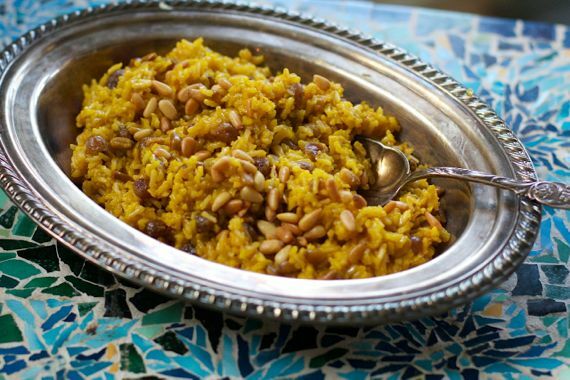 She chose an easy, straightforward recipe, that reflects her approachable, middle eastern food viewpoint, extolling flavor and texture by use of aromatic basmati rice, golden raisins, pine nuts, and the much loved saffron. Faith learned middle eastern cooking from her mother in law, when she lived in the middle east for six months. She adapted those recipes by making them more approachable for the home cook. An Edible Mosaic has over 100 Middle Eastern recipes, with a focus mainly on dishes from the Levant, but also a few recipes from other areas of the Middle East. It’s always a thrill to see another blogger launch a cookbook with recipes true to her heart and spirit, and I am especially delighted to see another blogger friend of mine, Lorraine Elliot, write the forward. This picture is from the cookbook, and used with permission, as I wanted to show you what it looked like using white basmati rice, since I used brown basmati rice. As far as the recipe goes, I used brown basmati rice instead of white basmati rice and had to make changes to the recipe, as brown rice needs more water and a longer cooking time. If you use white basmati rice, the water is only 1 1/2 cups and the cooking time before allowing to rest is 10 minutes. It will be wonderful either way. 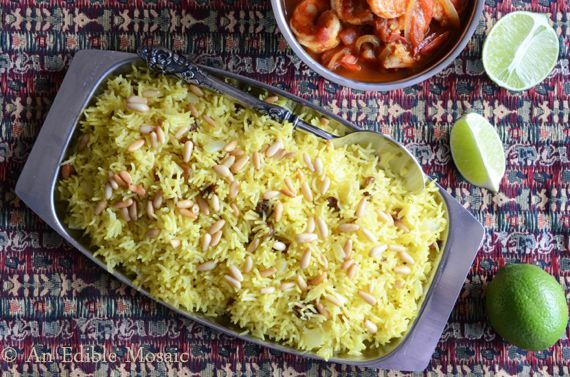 It was flavorful, with lots of different textures, as the chewy basmati rice, the golden raisins, the flavor and crunch of the pine nuts and, of course, the saffron all came together to make rice dish exciting. The only thing I would change for the next time is using less saffron. The pine nuts delivered such intense flavor that less saffron might have been better. Book Party Launch Giveaway. Head over to the launch party, as Faith is giving away over $1300 of stuff. A recipe from Faith Gorsky's cookbook, An Edible Mosaic, this basmati rice and saffron dish is approachable, and flavorful. 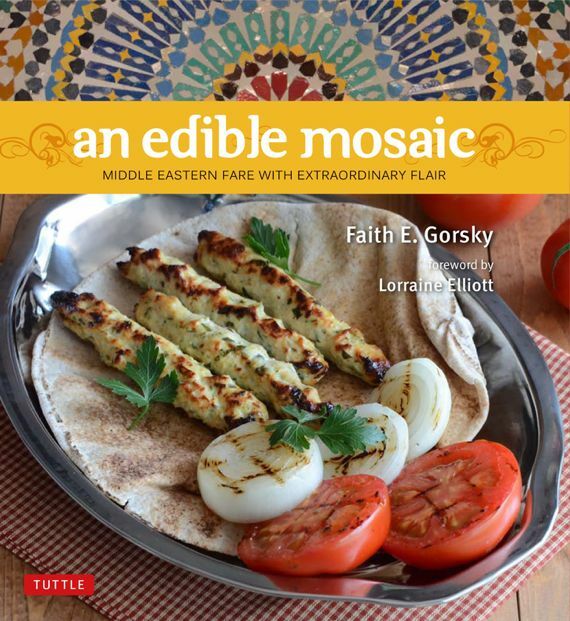 Recipe courtesy of An Edible Mosaic: Middle Eastern Fare with Extraordinary Flair by Faith Gorsky (Tuttle Publishing; Nov. 2012); reprinted with permission. Give the rice a stir, then cover the saucepan, turn the heat down to very low, and cook until tender, about 30-40 minutes (do not open the lid during this time). Turn the heat off and let the rice sit (covered) 15 minutes, then ﬂuff with a fork. Note: The original recipe called for cooking 10 minutes before turning stove off. I needed to cook for 20 minutes as I used basmati brown rice. Love that you photographed the dish on a mosaic table! Super-clever Angela!